Labour politicians want the Welsh Government to reconsider its decision to scrap a grant for disabled people. The £27m Welsh Independent Living Grant (WILG) is paid to about 1,300 people. That money has been passed to councils who are now reassessing recipients. Social Care Minister Huw Irranca-Davies told BBC's Wales Live programme he would not rethink the policy "in its entirety", but the transition will be monitored. The government said WILG was a "two-tier system" and it was working with councils to "support independent living for all disabled people". It was introduced to help people who previously claimed from the UK Government's Independent Living Fund (ILF), which closed in 2015. Those who qualify largely use the money to pay carers and personal assistants to help them live at home, work and socialise. The recipients are often regarded as some of the most severely disabled people. Campaigners fear the new system will mean reduced support, given the pressure on council budgets. They also want to see the "triangular system" that existed under the ILF preserved so an independent third party has a say on the care packages, rather than just the council and the recipient. Flintshire said future funding would be "insufficient to meet the agreed needs and outcomes of former WILG recipients"
But the Welsh Local Government Association said the WILG was "unfair" as new applicants were not eligible, and councils would ensure existing recipients got "appropriate care and support" in the future. In 2015 the UK Government cut overall ILF funding and transferred it to councils in England and the devolved governments. That move was opposed by many in Labour, including leader Jeremy Corbyn. The Welsh Government's decision to transfer its share of that funding to councils was opposed by Welsh Labour's spring conference. The vote was a defeat for the Welsh Labour leadership and social services minister Huw Irranca Davies. WILG recipient and founder of the Save WILG campaign, Labour member Nathan Lee Davies argues the Welsh Government should do what the Scottish Government has done and maintain a national fund. "I used to live in Scotland and sometimes I wish I still lived there so I could benefit from the Scottish Independent Living Fund system. "And that breaks my heart as a patriotic Welshman," said Mr Davies. "I also thought I'd be ok with the Welsh Labour Government but that's not the case at all." Labour AM Julie Morgan, MPs Ian Lucas and Susan Elan Jones and Welsh Labour Grassroots - the Welsh part of the left-wing campaign group Momentum - say the government should now review its decision. Julie Morgan said: "Welsh Government is separate from the Labour Party but obviously any major party conference where there is a resolution won in this way, and Nathan did it so well, I really do think it should be looked at again." 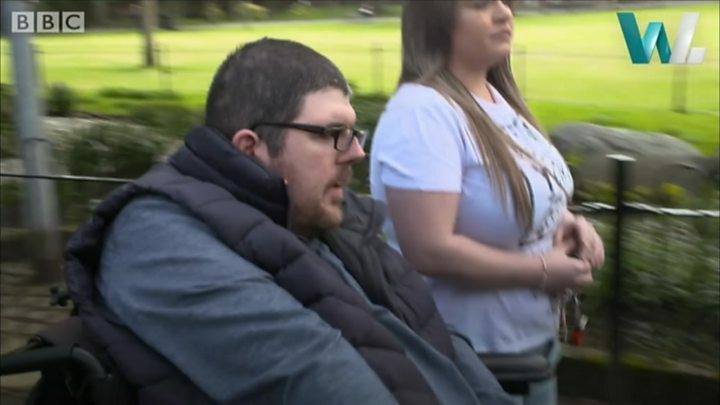 A Welsh Government spokeswoman said the decision was made after "extensive engagement with organisations representing disabled people" and it would "closely monitor" the transition. Mr Irranca-Davies said: "We're not going to rethink the policy in its entirety because the stakeholder engagement we had has brought us to this point. "What there is room to do is to monitor it and here's the guarantee I will give - if in our monitoring, and we've commissioned by the way two umbrella disability rights organisations to independently monitor what's going on, if we pick up glitches that need to be tweaked and adjusted you can bet your bottom dollar I'll be doing that." Independent Living Fund: What is going to happen now?